I’ve spent this weekend and the week leading up to it thinking about the various ways we, as a school, can improve our communication methods. I went through this process at my last school as well, and after consideration of the problem again I’ve come to this conclusion – setting up the channels with the technology available is easy, but making sure it is both sustained and valued by the community is hard. We’re constantly fighting the battle of content that dates quickly, and the increasing demands on teacher time that ultimately mean a reluctance to write-up content, especially if it needs to be done multiple times for multiple publications. * I should point out that for the purposes of this discussion I’m leaving out direct teacher-parent or school-parent communications over student-specific issues – that still tends to occur via email and phone calls and can’t be beaten when there is a pressing issue that needs to be addressed. Interestingly enough, of all of the above tools the one that is the least flexible for us is the website, and yet for many prospective families looking to enrol their kids it is the website that is likely going to be their first point of contact. So I feel that whatever the strategy, what we need to ensure is that the website doesn’t get neglected – it is the one place where content is most likely to date quickly and become less relevant for our school community. As we redesign the website, we’ll be making sure that those parts that don’t tend to change often (such as our Principal’s greeting or the rundown of our timetable structure) are kept to a minimum, and instead aim to feed as much of the regular activity that takes place in the school through to a regularly updating news feed that is front and centre of the user’s view. As you can see, when the tools are all linked together data only has to be entered into one of two locations, either the calendar (for dates and events) or the WordPress blog (for news articles/information). The information is then fed, via various plugins, application integration tools or RSS feeds, into our other communication channels, many of which families can then subscribe to in their favourite social application. 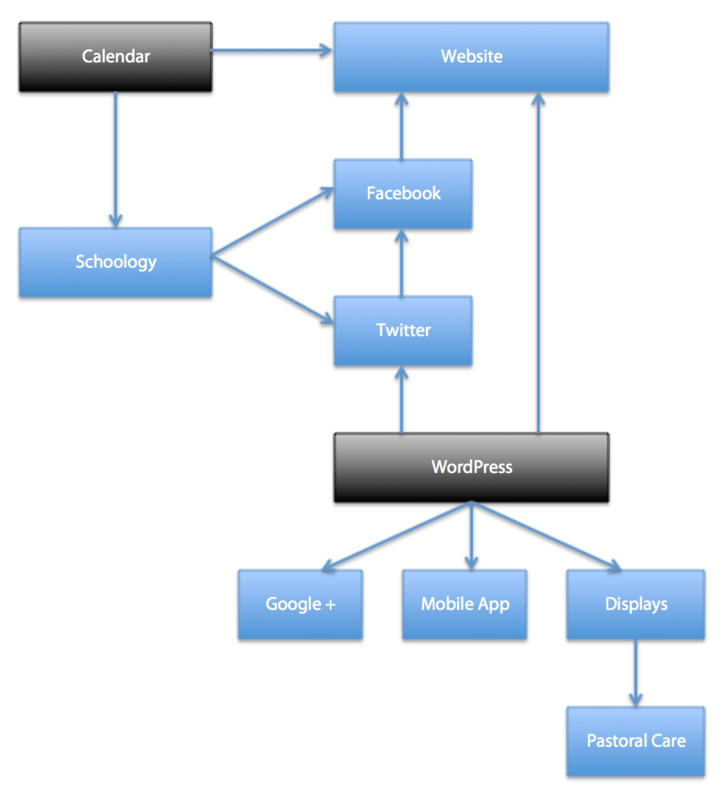 Right now there is no easy way to push the updates from WordPress to Schoology, nor is there an integrated solution that I like for a calendar/news solution (although I will be looking into that – a single point of data entry would be fantastic). However, one of the great things the Schoology developers have done is they have made an App API available for other developers to use to integrate their applications into Schoology. I haven’t investigated it in detail yet, but I’m thinking there may be an opportunity to at least bridge one of those gaps in the chain. So now that everything is linked up, the next step is ensuring regular content is published to keep our community engaged. We’re tackling this by providing every teacher with an account to the WordPress blog with authoring privileges, and providing some professional learning to hep those for whom blogging is new to learn the ropes. Since we need to ensure we’re publishing accurate and quality articles, teachers will submit their items for review, and identified staff in the school will then become our sub-editors, reviewing the posts for any errors, omissions or anything else that may need to be fixed up before publishing. We want the articles to be both reflective and forward-looking – we want celebrations of the great things the school has done in the past (posted within a day or two of the event), and posts about upcoming events and activities we want the community to engage in. In that way we give everyone a reason to visit, whether it be hearing about an event they were unable to attend or finding out about an activity that is approaching and needs their involvement to be successful. However one of the criticisms of this kind of approach that I have had directed at me at the past is that there are many families that don’t want to have to visit the website every day, or to subscribe to the site and get a barrage of emails or posts on their feeds each time a new article is posted. Some people still prefer the good old newsletter – either an email or printed copy. Thankfully, there’s a WordPress plugin for that, and we’ll be ensuring that for those people who prefer the good-old-fashioned fortnightly email everything that gets posted to the blog (it’ll do tweets as well!) in the previous two week period is bundled up and sent to their inboxes. So that’s a run down of our strategy from a technical standpoint – to eliminate the need for extra work required to draft additional items for a newsletter and reformat existing content into a different publication. The idea is that a write-once, publish everywhere strategy will mean staff are more willing to contribute regularly. With the number of staff we have and the number of events that happen at the school, I’m thinking that if each staff member posted one article every month, we’d have a vibrant, regularly changing online presence that will keep all of our parents and community partners interested and engaged in our activities at the school. Hopefully, and I’m feeling pretty optimistic, we’ll be able to overcome the hard point of communication – the regular updates and ongoing engagement – and take advantage of the power this technical setup provides. I’ve spent the last few days putting together a brief audition video for TEDxCanberra – it was suggested by another teacher that I give it a shot, and I figure I’ve got nothing to lose. I’ve been doing a lot of investigation and work recently around a model of education that has students working directly with the community through projects that are interdisciplinary – an approach similar to Challenge-Based Learning, Project-Based Learning and similar models. The audition video is on YouTube, and a quick search for TEDxCanberra will show you other potential speakers and topics. While it’s not the greatest piece of video I’ve ever done, I think it gives a good enough picture of the message I’m sharing. I’ve seen too often in classrooms and schools activities and lessons that just don’t engage kids, but if you talk to these same kids about what they do outside of school and why they enjoy it, each time one of the key things they mention is the fact that they are involved in something. That aspect of being a part of something bigger is severely lacking in most classrooms, and there’s no excuse for that anymore. With near ubiquitous Internet access, mobile computing and information at everyone’s fingertips, we should be challenging our students to be solving big problems, and helping them make sense of the world around them to formulate answers that consider their values and ideas. To do this effectively, we need to stop working within the artificial boundaries created by subject disciplines, learning areas or year groups. I hear colleagues saying that the Australian Curriculum prevents us from being able to do that, but that’s a narrow view of what schools can do. We have significant flexibility when it comes to implementation of the Australian Curriculum, and nothing published by ACARA suggests that subjects need to be taught in isolation. In fact, reading the curriculum documents, it is fair to say that there is an expectation that teachers look for links across subject areas to create richer educational experiences for our students. So, it’s my hope that I get the opportunity to expand on my audition further, and to share that message with as many people out there who’ll listen. The research supporting more collaborative and holistic approaches to education is everywhere, yet high schools on the whole are reluctant to consider structures or models that vary from the existing rigid, timetabled structure of single subject courses. No one learns like that in any real world situation I can think of. I challenge you, the next time you’re reading, watching videos or anything else, to switch off after an hour and do something else, and not return to any thought-provoking ideas that may have been stimulated previously. You’ll realise pretty quickly that sometimes you need more than an hour to really engage on any sort of real level with that topic, and in other situations, 15 minutes might be all you need. Our students know this, yet we force them to work with a system that is older than most of our grandparents. It’s time to change – it’s been talked about for years, but talk without action may as well be silence. We do a disservice to the youth of today and the future of civilisation by refusing to consider alternative approaches to “school”. I spent two days last week at the IWB Solutions conference hosted by IWBNet in Sydney and it’s got me thinking again about the increasingly complex puzzle of true integration of technology into learning within our schools. One of the things that is finally becoming clear to many teachers is that the greatest barrier to successful use of technology is not the costs associated with it, but the failure of schools to change the way they operate to fully leverage the benefits. As Chris Betcher kept emphasising in his Keynote on day one, there is value in differentiating between teaching and learning. There are times in every class (and I don’t care what you teach) where standing up the front and giving your class some factual information or demonstrating a skill IS the best way to introduce or explore something. You CAN do this in interesting and exciting ways – ways that engage kids with the ideas you are presenting – and this can still be defined as teaching. You are the focus and in this case you need to be – you remain the person with the knowledge and it is your role to impart that to others. In other situations, the students are actively engaged in learning – they are seeking answers to problems, questions, issues etc either individually or in small groups based on what they have previously been taught, what they have previously learned and what they want to know more about. The teacher in this case plays a facilitator’s role – we guide, nudge, encourage and nurture without giving away the answer (if indeed there is one for the issue under investigation). It is useful to keep these practices separate – both require different pedagogical approaches, and each is supported by technology in different ways. An IWB may not be an effective learning tool in a classroom, but it can be an effective teaching one – just like a 1:1 program will not necessarily improve the teaching capacity of the teacher. Following on from above, it should be noted that what technology does is amplify the effectiveness (or lack thereof) of the teacher. A good teacher will be a good teacher regardless of the technology they have access to, but a good teacher who knows how to use technology has increased capacity to be much better. Likewise, someone who’s pedagogy is not effective will not improve when you provide them with technology – it will become another tool that is used poorly and fails to improve the learning experiences of their students. Since a good teacher uses multiple teaching strategies, pedagogies and tools to keep students engaged and active in the learning process, it should be evident from the above that no single piece of technology will lead to an improvement in the outcomes of their students. Instead, multiple technologies need to be made available that support each of the numerous teaching methods employed by the teacher and the learning activities that students are participating in. This requires a massive investment if every student is going to have access to every tool in every classroom – something not possible in most schools in the country. Which raises the question – are schools as they currently exist still relevant in society today? If students can walk out of the classroom into a world where their access to information and learning opportunities is increasingly growing, is the classroom a productive place to be spending a third of your day? The evidence is clear – that the single biggest factor effecting the performance of students is a good teacher – so the classroom still has its place. What needs to change is the approach we use when students are in our classrooms with their teachers. Teachers must be more open and flexible; be more willing to adapt and allow the lesson to evolve as students become caught up in the experience of learning. Our current systems with structured timetables, concrete curricula and fixed hours are no longer appropriate for how our world operates, and the schools that begin changing some of these “ancient” practices will be the schools that groom the most successful citizens in our future. Nothing I’ve mentioned above is new or ground-breaking, but in the hope that my voice added to the many others will help make these points heard, I felt the need to get them out there, as it were.